I discovered some important things this past weekend while visiting my brother and his family in Wisconsin. For one thing, if you decide to go fishing at high noon in July on a lake whose maximum depth is six feet, it’s not really called fishing. It’s called taking your worm for a ride. Another thing I learned is that you should never trust an 11-year old boy’s taste in discount sodapop. Take my word for it when I tell you that Dr. Faygo and Dr. Pepper are not even distant cousins. But my most illuminating discovery had to do with my 9-year old nephew. With my older nephew, I love spending time with him because he’s already smarter than me and we can spend hours making dioramas representing pivotal moments in the Hopi tribe’s history. But with my younger nephew, ever since he was born, I have had an uncontrollable need to squeeze him to near asphyxiation. It’s a constant struggle for me to keep my hands off his little face. 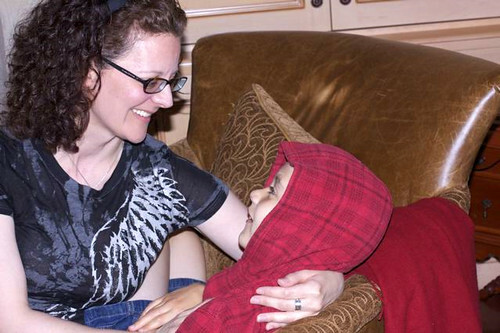 I was never quite sure why, until I spotted him across the room from me wearing his little red hoodie, and suddenly it hit me. He is the spitting image of my all-time favorite doll from my childhood. The doll my mom bought me at a flea market when I was about two years old. The doll I carried around so much that all the velvet wore off her little body. The doll my mom had to sew up dozens of times when, either from natural causes or from the cruelty of my brothers’ friends, her stuffing would come loose. The doll I named Red Baby. Aww. Nine year olds are so, you know. Nine. 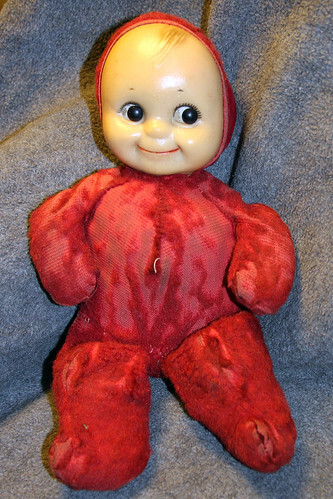 Red Baby… 1/3 less sheer horror than Sometimes Rabbit. Red Baby’s got your left! One of my children pushes my fat veins in in an effort to kill me. Kill me slowly, they admit… and I have to be patient and wait while they do it. No. 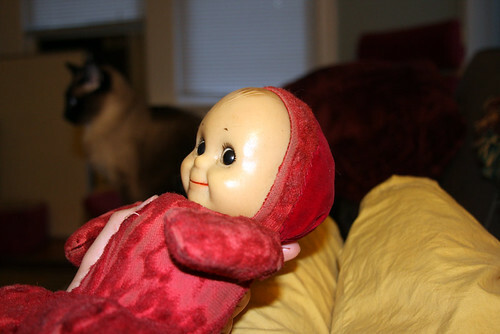 Your nephew is adorable and your old red baby is horrifying. How can you live with all of those frightening images in your world? I’d be in the fetal position, on the floor, sucking my thumb if I ever visited your house. Kewpie Doll faces run in the family, right? MOM…chuckling at the mental picture of you and Red Baby. I don’t have any nieces or nephews yet, but I can only hope that one will look like my favorite childhood toy, a green beanbag turtle named Butchy. don: so true. and nine year boys are so, you know. boys. dave: you just gave me the brilliant idea to craft a mini Sometimes Rabbit head for Red Baby! thanks! claire: you can always count on her. delmer: kids are evil. just plain evil. churlita: hey! you take that back! Red Baby is the cutest baby in the whole wide world! DD: no, i’m drawn to that expression because of a particularly wacky alaska airlines flight attendant. hey baaaaabies! MOM: it’s true, they do! shari: i feel like i don’t even know you anymore, shari. cheryl: that would be so awesome! what’s cuter than a beanbag turtle? aside from Red Baby, i mean. That fact that you had THAT doll since aged 2 explains a lot about your fascination with the creepy and disturbed. Your cute nephew not included of course, he is just plain cute and squeezable. vahid: Red Baby is from an alternate universe. the universe of CUTE! robin: is no one seeing the resemblance? they’re identical cute twins! serap: all right, fine. my adorable Red Baby and i are gonna pack up our toys and go home. Faygo baby. Oh, now I need to go buy some redpop.